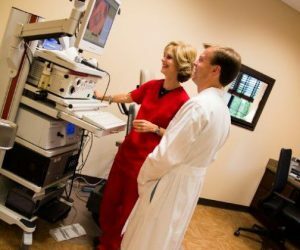 ExcelENT of Alabama also specializes in diagnostic and therapeutic services to individuals who present with a variety of voice disorders and vocal symptoms. Complete voice and swallowing evaluations, voice and swallowing treatment and visualizations of the larynx and swallowing function are performed by Carleen F. Ozley, M.S. CCC-SLP. She is a licensed speech language pathologist with many years of experience in the specialized area of voice, swallowing and paradoxical vocal cord dysfunction. Dr. J. Christopher Davis reviews all exam results. This team approach between our voice therapist and ENT Surgeon allows our patients with vocal and swallowing dysfunctions to experience the benefits of communication, collaboration and comprehensiveness when seen for assessment, diagnosis and intervention at ExcelENT of Alabama. There are many different symptoms you may experience if you have a voice or swallowing problem. If you experience any of these symptoms, a complete diagnostic evaluation should be considered. Specific treatment protocols are provided for the various Voice & Swallowing diagnosis.